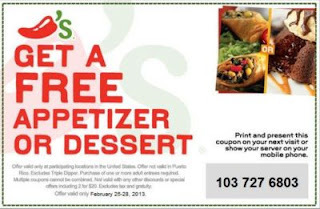 Free appetizer or dessert with coupon @ Chili's. Click the link below to go to their Facebook like them to get the coupon. Take your coupon to your local Chili's to redeem. Offer good Feb 25th-28th 2013.